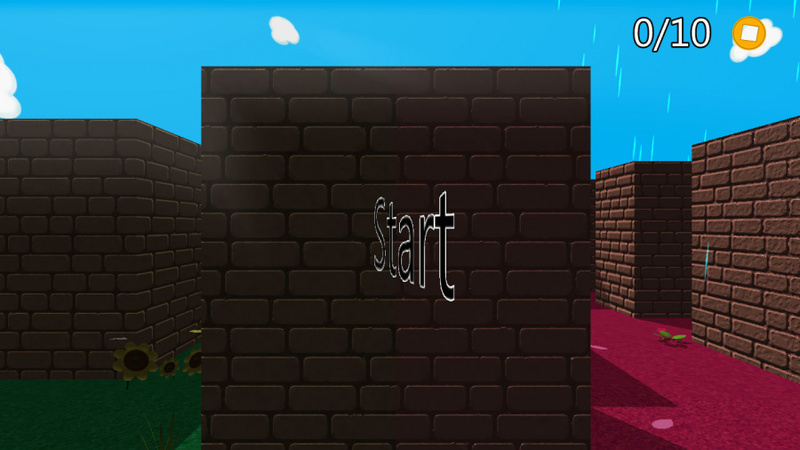 Sometimes the simplest concept can make for an utterly addictive and engaging virtual experience. From Wii Sports to Angry Birds, the original Mario Bros. to the Mario Party series, there have been plenty of games that have bridged the gap from casual to advanced players, and it all starts at how accessible and universal the concept at the core of the game is. In comes Maze, a game about, you guessed it, mazes. On paper, the idea of navigating and exploring a collection of labyrinths while platforming and gathering coins sounds like it could make for wholesome entertainment. Unfortunately, TreeFall Studios - the developer of The Letter - has constructed another game that lacks sensible execution. In other words, Maze certainly isn't a-maze-ing. 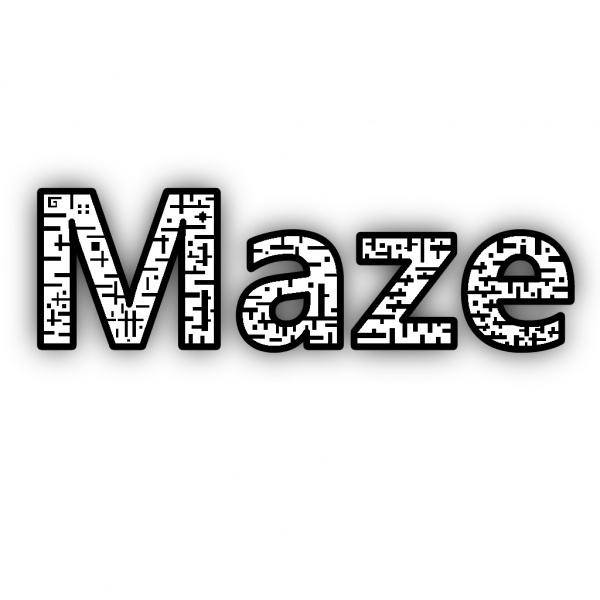 On a positive note, Maze is a much more inviting game than The Letter. Even if the same generic and ugly assets are present this time around, there's a better sense of production and understanding of the necessary elements of a video game – menus, options, save functions, and an actual reason to play. 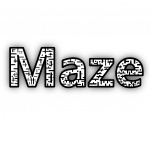 That's right, unlike The Letter, Maze is actually built around a gameplay concept and features legitimate – though very limited – elements that persist throughout the adventure. It's not exactly the most layered or complex design out there, but it is - nevertheless - an improvement over the studios' previous work. It at least proves that it's listening to and / or learning from the criticisms of its previous effort, which is absolutely welcome. The problem, however, is that Maze just isn't much fun to play. It starts out being harmless enough, but as soon as precision platforming and nonsensical level design show up, any chance of enjoyment is pretty much out the window. On top of that, there are some visual design choices that are, putting it lightly, disorienting – like a maze made of bright coloured panels that intermittently change colour. We cannot stress enough just how off-putting some of the colours and patterns can be; in the second world we ran into a set of stages that instilled a horrible case of motion sickness in both of us that played it. It was so bad that the console had to be booted down for the day and returned to at a later time. We should also disclose that the neither of us have a history of getting ill from playing video games. When swinging the camera around, we even noticed an effect that makes the environment bend and expand as if you're looking through a fisheye lens. It's tough to stomach. With each stage containing 10 coins to hunt and gather, and many of them being tucked away in extremely out-of-the-way places, finding your way to the exit of the maze - let alone collecting things - can be a major grind; that is accounting for the fact that we're talking about the core concept. And yes, you have to get all 10 coins to advance. It should also be said that you're limited to walking and jumping, so once hazards present themselves your means of protection boil down to simply avoiding them. It doesn't help that the controls are incredibly unwieldy; not only do you move very slowly in general, but turning from side to side is even more sluggish. When you're desperately trying to locate every coin in a narrow maze to quickly make your way out, it's as though you can't adjust your view fast enough to align with each new corridor. Then, when the level design presents very large spaces without many obstacles, it feels like you're crawling to get to where you need to be. 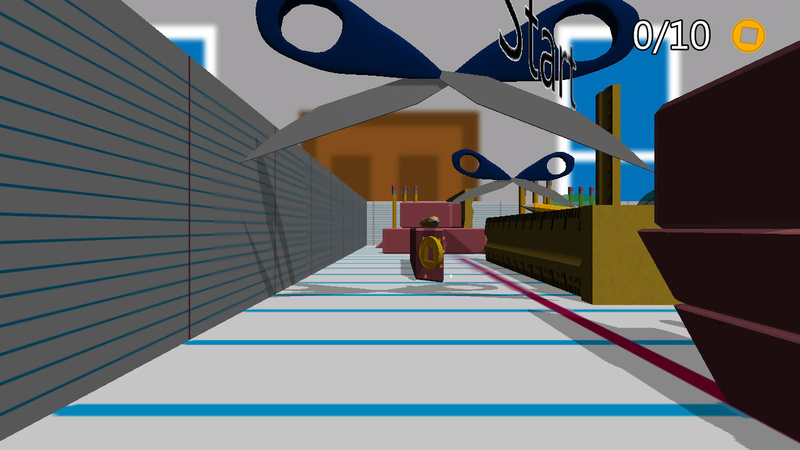 Outside of the single player mode, which makes up the bulk of the package, Maze has local multiplayer and an arcade option. Multiplayer can be semi-entertaining for a couple of matches, but the limited number of stages, along with the fact that starting points and coin placements didn't seem to be randomized, really diminishes the chance of it retaining any lasting appeal. Arcade mode presents a couple of okay stages, loaded with 20 coins instead of 10, and asks you to gather them all in a set amount of time. Both of these modes feel tacked on and unsubstantial, seemingly existing for the sake of making the package appear more robust. For the asking price, ultimately, there's a respectable amount of content here, so that's not at all the problem. It's clear that Maze is a much more cared about project than The Letter, but unfortunately the final product is far from impressive. There are some things to commend, like the amount of environmental diversity for example, though when the mechanics are sloppy and movements can trigger wooziness, it's hard to see past the negatives to care about the positives. And besides, at its very best, Maze doesn't really ever advance beyond mediocre territory. While it's immediately and undeniably clear that Maze is an improvement over The Letter, that doesn't mean it amounts to all that much. With generic assets and a lack of tactful design, along with plenty of other poor and questionable areas of production, there's nothing here that's all that compelling. 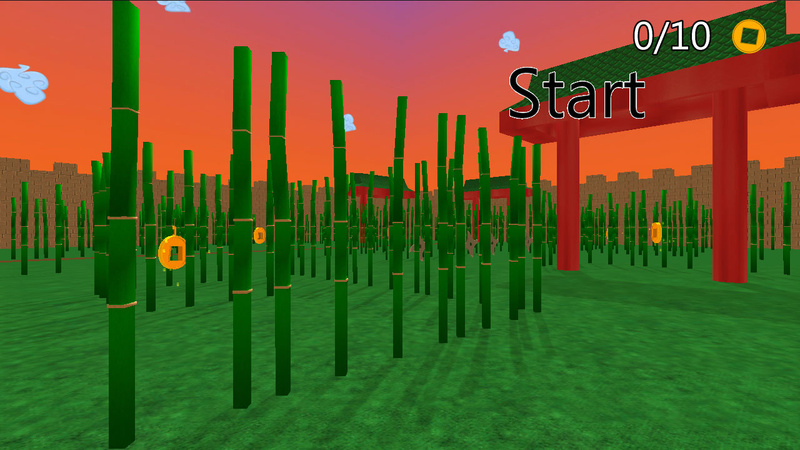 We genuinely like the idea of a game filled with bite-sized mazes to explore, and we think such a universal concept such as this could make for a delightful downloadable escape, but this effort just doesn't deliver the goods. Get lost in something else on the eShop instead. You forgot to consider the smallprint: "This game is best enjoyed whilst high"
Not to be blunt, if I wanted to play a maze game, I'd pop in the game that started it all, and any gamer knows who I'm talking about. ...but from what I read in this here review, at least there's more effort put into this game. Well they seems to be improving anyways. Maybe next time they'll make a game that's only mediocre. I know the fact that this game can be placed right next to Super Smash Bros. for Wii U on the main menu screen is illiciting some kind of reaction from me, but I don't know what reaction that is quite yet. Hey, there's still lots of great games on the eShop and some great games coming too, so don't get too down in the dumps about it. I do agree the eShop needs some serious quality control though. There are 4 other games that are cheaper that I can recommend over this, but I would give this one about a 5 or 6. Such a vast improvement. I enjoyed it. Abyss, Rush, Edge, and 99 Seconds (possibly also moves) are the same prices or less, and are really great, but this one IS worth checking out and supporting the dev. Every game he makes, he makes a huge step up. Let's keep him going. I suppose there's nothing too terrible about having amateur developers producing their early works on the eShop, but it's definitely not the right place for these games to be. On the other hand, this is an easier way for the dev to get visibility early and plenty of feedback no matter how critical it may be. @BLPs I feel like, if you have to pay for something, and it was mediocre/terrible/or whatever, then you have the right to be critical. If it was a free beta, that's where the feedback counts (and isn't that the whole point? ), but if you've paid for something and its trash, then you have a right to tell others your thoughts, the developer can then use that as feedback if they want, but shouldn't call out the media for being unfair, if your game is genuinely good, then people will write something good end of story. This has got to stop. Sure, every gaming developer starts somewhere and there's always gonna be bad games at the start of a developer's life - even Nintendo did it - but this does not belong on the Wii U eShop. It's supposed to be a place where one can buy a quality downloadable game, something that looks like it belongs on a quality system. The eShop is slowly turning into a land of shovelware or things with the quality of an alpha that absolutely should not be publicly purchasable. Nintendo really need to step up their quality control, for the good of the community. The thing is, you can make really simple games and even release them if you want; as long as they ain't obviously clunky, buggy, messy junk. Don't be afraid of releasing simple games early on if they are decent. That's not the issue as I see it. It's about the quality that some people are actually putting out there and asking money for it on a service like the eShop. Whatever you release, it has to be well made, bug free, solid and basically fun imo; even the really simple games. Also; you should ideally be asking for an appropriate amount of money that's relative to what you're offering; which some of these games clearly aren't. They're all very simple, many people would even hate on them for whatever reasons, but at least I can say hand on heart that they are all very polished, no obvious bugs or clunky controls and badly designed menus etc, and they are all basically good, simple, mostly clean fun. Also; they are all totally free to download, ad free and micro-transaction free too; so I feel perfectly at peace offering these to the general public to play and maybe even enjoy. Dude; you have your entire life still ahead of you. There's plenty time to get some stuff put together and put it out there. Just keep working away on your ideas, don't procratinate too long, and then at some point take the plunge. Now; and I hope this is a good bit of advice: You're better off releasing total crap than absolutely nothing ever. Don't let the fear of whatever the rest of the world thinks basically stop you from doing anything. Better p*ss off a few people but actually do what you want than be miserable and they wouldn't care regardless. Just don't go out of your way to take the p*ss out of others [basically abusing them] with obvious junk for the sake of making a quick and easy buck off ignorant casuals is all I'm saying. That's not a good way to do business or live your life [to be a decent human being] as far as I'm concerned. Myst. Doom. Wolfenstein. In line with some of Treefall's general structure, but over 25 years old and with unique twists. It looks like the game is being made in DOS with the free Paint program that came with Windows 3.1, that the bug checker is 4 and has a hard time spelling his own name and does this to support his part-time college job of making uninspired logos for local businesses lacking creativity and ambition. I'm not saying change the industry, just to stop wasting people's time with half finished, alpha pandering. If you can't do backgrounds, character sprites or any worthwhile art, hire people or make connections. If I were Minecraft or Slenderman's dev, I'd be offended that this is what my work inspired. It's better than the Letter, but so is Superman 64. Retro City Rampage didn't make money on the Wii Shop. Nintendo removed the base line and opened the doors. Junk and garbage came to the eShop. Still funny to me, terrible games sold for dirt cheap flooded the Wii Shop with shovelware and made money. Decent games failed to meet sales expectations and never saw a dime. Am I stoked people buy the trashy titles? No, as it usually means less money to the truly exceptional ones. Is it my money they're spending? The eShop is full of screenshots. Do your homework and don't buy it. Seriously. It's less difficult to avoid garbage on the Wii U eShop than it is to avoid all the 3DS listings. It's probably something that should be obvious but I know little about retro. Yeah, Pac-Man. Though Clu-Clu Land was not too shabby. @NodesforNoids Just because it might have the blocky-ness of Minecraft or the PC graphics of Slenderman, does not mean it inspired from those two games. Well put, everyone on the site complaining about devs on the eShop needs to understand this. I feel like Nintendolife is getting worse at reviewing. It seems as though this review would of gotten a better score had Tree Fall never made the Letter. It is also kind of sad how this and meme run got worse scores than Spikey Walls, a game that is a complete clone of floppy bird and was an experiment by rcmadiax to test using miiverse to convince people to buy his games. Can't say i'm surprised, but at least they're improving. Maybe I'll check it out, out of curiosity once it's inevitably discounted to $0.49 like The Letter was. Glad to hear the dev is listening to some of the criticism, but I'm not surprised it's awful. Only bad thing though, is that it doesn't sound like it has the only redeeming thing The Letter has....to a certain kind of person (like me) The Letter's attempts at a story and trying to be scary were actually somewhat funny due to how completely terrible they were. I've actually found this game rather enjoyable. It has issues for sure, but all things considered I think it's pretty well developed, especially for a budget game. While I definitely don't agree with Dave on the score, he is absolutely spot on about certain mazes having the potential to make you ill. It happened to me! Thankfully it was limited to just two mazes in the second world. 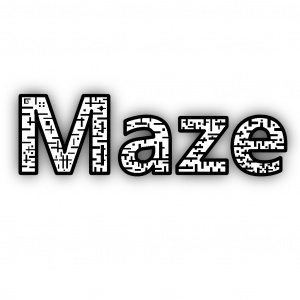 Maze has been a pleasant surprise, and I'd recommend it to anyone, so long they have strong stomachs. I feel the same way about quality and doing research. I mean it's not that hard considering Nintendo never really markets shovelware. Most of the games on the eshop splash page and in sizzle reels are of decent quality. Unless you just go into eshop everyday religiously to see what's new or buy based on verified Miiverse user posts you shouldn't end up with so many turds on your hard drive. I will support this dev. I downloaded the Letter and this too. I know he is getting experience and he takes the consideration to write and answer. That talks very good about him. When have you seen a message from some of Nintendo office in the NL boards? I like devs who care about get closing to the people. "Maze has been a pleasant surprise, and I'd recommend it to anyone, so long they have strong stomachs." I've never heard of motion sickness from poor textures in a game before. That alone will keep me far away. I personally believe the Letter was a scam. Saying that it was just a build that will "eventually" get better over time. It's the same thing Ubisoft did with AC Unity. They knew it wasn't finished, but shipped it anyway. Much smaller scale, sure, but it's still very similar. It still doesn't help matters that there is no danger whatsoever with the worst ending ever conceived. That ending was so bad that Creative Writing 101 would have flunked him on the first day of class. It's equivalent to when you watch a horror movie and there's a "dream sequence", and everyone groans. It's cheap, dirty and is only for people who can't come up with anything better. If you want to support him cause you think he's a good guy, by all means, go ahead, but I certainly wouldn't expect anything creatively better. An indie developer said it is a good deal. This is the greatest sign that a game is worth checking out. @MoonKnight7 The textures are fine. The worst culprit was a neon colored level with flashing lights. It was challenging, but a bit much. @RCMADIAX Yeah, there is a good amount of content and enjoyment here for just $2.99. I really like the soundtrack also. Wii U owners have been buying this trite just because it's cheap, and way too many bought The Letter just to laugh at it. How you spend your money determines what you want on your console. Do you want cheap crap, or quality endeavors? Well, it is your forte. I mean, it must be good, ...because it's cheap. I'm gonna buy this because Eli is a great guy who really interacts with his fans. He has kept his word about updates to The Letter as well. He has released one and another is on the way. Of course he still has a lot to learn, but he really seems to love making games and I don't feel at all that he is trying to scam anyone. I think if all game designers had his spirit the industry would be much better off. lol why does it reminds me of the windows 95 screensaver maze? @Quorthon I'm sorry, how many games have you made that got a 5 or higher on this site? Because RCMADIAX has five of them. Better yet, they have three games that got a 6 or higher. RCMADIAX is a great developer. @Oragami I still have fun with Blok Drop U & Poker Dice Solitaire Future. And both Blok Drop X Twisted Fusion & Toss n Go are good newer games as well. 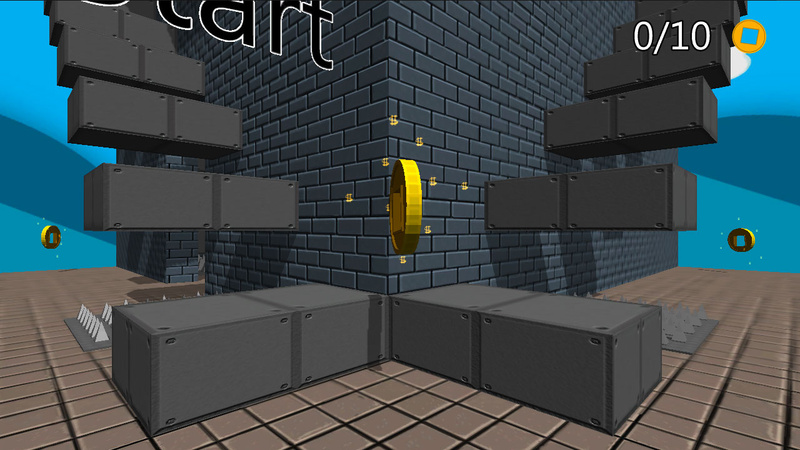 Maze has fun bonus levels, one which is based on Blok Drop U. "Of course he still has a lot to learn, but he really seems to love making games and I don't feel at all that he is trying to scam anyone. I think if all game designers had his spirit the industry would be much better off." Given the "scam" line, I can't help but think this was directed at me. Just because he seems well mannered does not excuse him of anything scam related. "The Letter" does not deserve to exist on a console. Does it deserve to exist? Of course, but only for portfolio purposes. It should have never made it to paying customers. I understand that it is a learning process, but that's what school is for. Spirit or no, the guy just doesn't have any creativity. That's perfectly fine, but that doesn't give him the right to use the eshop as his playground to learn while making money. You see it as smart; I see it as a scam. It is going to start an unstoppable trend of sending out unfinished games that wouldn't even survive on kickstarter. Ha! What an absurd comment. What the hell does it matter how many games I've made? By that logic, no one can criticize anyone or anything unless they've done exactly what someone else has done! I'm not sure how you define the word "great," you clearly have lower standards than I do, as I would use it on developers like, oh, say Treasure, Level-5, Bioware, Team Meat, perhaps 2D Boy and WayForward. Personally, I would also not go with reviews from just one website as it's not a very good measure of the quality of a game. For instance, some sites mistakenly gave Other M positive scores (although this initially garnered a positive average score, in my opinion, because most reviewers had trouble admitting it was as bad as it was. I certainly didn't want to admit it at first). By all means, good for Rcmadiax, he's release a whole bunch of shovelware and charged money for at least one Construct 2 tutorial. At least he isn't kidding himself in that regard. I agree with everything in your post. Except that I don't see Treefall Studios as much as a scam just yet, and more blatant incompetence. I see RCMADIAX as a scam, as his excuse for Spikey Walls was, as stated on this site, "Wii U owners bought crap in high numbers (referencing The Letter), so I'm going to make crap, too." I'd be disappointed to see The Letter outsell anything I did, but I still wouldn't lower myself or my standards to those levels just for money. "Except that I don't see Treefall Studios as much as a scam just yet, and more blatant incompetence." That's probably more on point than saying it's a scam, but honestly, I don't see much of a difference between the two. One is just a tad more honest than the other. Having said that, yeah RCMADIAX has kind of been a turn off for me, at least with what's been out lately. When I first heard of him and Drop Block U, I was intrigued, but now I know that they won't make anything more interesting. I see your parallel. It's just quick turn games where it's quantity over quality. That's not the kind of eshop I want, so I'll put my funds elsewhere. Am I to understand that you have a presence on the eshop or some place similar? I'd love to know what you've worked on. I'll check it out, unless I already own it. Totally valid point. I would say, the longer Treefall continues in this vein, the more scam-like it becomes. It's a real pity considering the intense work so many other fresh indies reveled in for titles like Super Meat Boy and Braid and the like. I gave Blok Drop U the benefit of the doubt, but my girlfriend and I finished it in about 30 minutes or so--play time not even long enough to be able to rate it on the eShop. Devious, if you think about it. Those who are willing to play it long enough to rate it in the shop gave it a high rating, and the rest of us who walked away don't have the chance to rate it. I agree, this is not the kind of eShop I want, and I'm frankly disturbed and shocked by the number of amateur hour, classroom tests appearing in the eShop being passed off as games. And just baffled how many of them are colorless, gray assaults on the eyes! Yes, I am part of a dev team, but have not linked any of that to this profile. I wanted to talk Nintendo and gaming without having to play nice or be painfully politically correct, but the cost there is that I feel it's unwise promote my team's game with a profile many outright hate because I'm critical in ways people are, apparently, afraid to hear. I don't criticize Nintendo because I hate the company--I grew up with Nintendo and love the company. I criticize because the Nintendo I grew up with is a shadow of what they were when I was a kid, and I recognize that ignoring their faults and pretending everything's just fine the way it is not only accomplishes nothing, but is potentially dangerously self-delusional. If I'm willing to lie to myself about something as "unimportant" as video games, how bad must I be at real life issues? Rant aside, my team has spent the last year overhauling our original Android game for a console release and have been in lotcheck hell for a staggering amount of time. But, we're proud of our game, we poured a lot of effort into it, given it a robust amount of content, a new mode, extra achievements, new levels, new graphics, streamlined gameplay, etc. While I'm far from the best artist out there, I have to hand it to our programmers, who crafted sharp, responsive gameplay that is addictive and just feels great when you work out the core mechanics. It's not out yet. But it's so damn close. I wish we could do private messages on here. I'd tell you which one it is. The trailer is online (with a release date we super missed). Try this, maybe, my NNID for Wii U is ResidentProber or possibly Ab-Duk'Tor. I never remember which one of those is the one you can search. Shoot me a message on there. At the latest, I fire up the Wii U every Thursday to check the eShop. Most of my time has been on the PS4 lately, but I did play through Fairune on the 3DS, and found some of the puzzles in there to be deviously brilliant, if not, at times, painfully old-school (spend a lot of time walking against walls for secrets). It's cool man, no worries. Criticism is important, especially when it's something you care about. As much as I love Nintendo, there are some frustrating things that just make me say "why?" While I believe the phrase "Nintendo is a shadow of it's former self", is a bit over dramatic, I understand what your point. Nintendo doesn't have the same amount of influence they once had in their glory days. However, I believe they are agile enough to right the ship, but we'll see. The market has just changed so much since the 80s and 90s. I just sent you a friend request via the Wii U. If you want to point me toward your game that way that's fine, but if you're not comfortable sharing that information, that's ok too. But I'd be more than willing to give honest feedback once your game releases. Just as a sidebar, I had no idea you were a developer and I think that's just awesome. I really wish you and your team the best in getting your game out there to the public. Kudos to making it this far. I agree there are scam artists on the eShop (NinjaPig Studios, I'm looking at you). It's just my opinion, but I really don't think Eli is trying to scam anyone. The guy really seems to be trying. Keep in mind too that he had to get approval from Nintendo to put his games on the eShop. Perhaps the eShop isn't the best place for his games, but I would blame Nintendo for that, not Eli. @Quorthon Ha! What an absurd comment. What the hell does it matter what you think about RCMADIAX? By that logic, everyone must have the same opinions as you. I'm not sure how you define the word "great," you clearly have higher standards than I do, as I would say this indie developer is making very good games. Personally, I would also not go with reviews just on Metacritic as there are only 4 or 7 reviews for each game, and also those scores aren't super bad. For instance, I and many others on this site really like these games (although you don't, I do. I certainly didn't think they were bad). By all means, good for Rcmadiax, he's released a whole bunch of games that are really fun. At least he isn't kidding himself in that regard. I'm sorry, I didn't realize I was talking to a child. I don't think it's appropriate for someone of my extremely advanced age to speak to such a youth on an "equal" level. By all means, let me know when you grow up. Ha, I'm actually very comfortable promoting the game, but it needs to be in the proper venue, and I don't believe a random username on here is the way to do it. Denis Dyack and Phil Fish couldn't separate their aggressive personalities form their game developer sides, and this has not yielded the most positive results. I would rather separate the two. When you're this obscenely passionate about video games and this industry, it's hard not to be aggressive about some of the more heated elements of it. Also, fair enough on the "shadow of their former self" note. Indeed, in some ways, they are bigger than they used to be (particularly with their money in the bank), but when it comes to their impact and influence in the industry, that is a mere shadow. The industry no longer looks at Nintendo for innovation or leadership, the industry views Nintendo as the weird guy that keeps trying to reinvent the car when there the models everyone wants to actually drive are selling just fine. Or perhaps, they're trying to fix an industry that, in many ways isn't broken--but is broken in other ways. I know this is getting a little long, but I think the industry needs to be moving towards a "unified platform format" where any electronics manufacturer can make a game console, all games play on any console, and everyone that has the money (like Sony, MS, Sega, Nintendo, EA, Activision, etc) can actually run their own digital shop via the unified platform, the way set-top boxes feature Netflix, Hulu, Crackle, Amazon (sometimes), etc. And like movies or music, every game plays on every player, with all games scaleable, and a wide range of models with varying power around a central standard. The reason for this is that, and this is a line I've used regularly elsewhere, but the video game industry now has Hollywood budgets without Hollywood audiences, which impacts creativity, growth, and revenue. There are third parties that want to move towards this, with EA being quite notable, and with the number of AAA studios going to mobile (this is a concept that mirrors Android) for the larger audiences, I think it's going to happen one way or another. This is a way in which the industry is actually broken, and despite the success of the PS4 and XBO, dedicated consoles are limiters to growth. Unless Nintendo creates this very concept in their next machine, and does the unthinkable--allowing Sony and MS to open their own shops--I am extremely skeptical, though hopeful, for their future. As it is now, I have finally come around to thinking they need to step out of the console business, and that they could truly dominate the industry as a third party, the way EA can sway MS and Sony these days. Imagine the sway they'd hold to walk out and cause a bidding war for exclusivity between MS and Sony as I don't think they'd "spread it around" the way Sega did. But if they released a more open platform where third parties could open their own shops if they wished, that would, without a doubt, bring them back in record numbers. I know Nintendo has said that if they get out of the console business, they'll get out of gaming, but that's an insane amount of hyperbole when you actually think about it. Would they really let franchises like Mario, Zelda, Pokemon (okay, they don't technically own that one), Metroid, StarFox, etc just disappear into the nether? Besides, Iwata has said a lot of things he hasn't followed through on. Like stepping down. "Perhaps the eShop isn't the best place for his games, but I would blame Nintendo for that, not Eli." Don't worry, I blame Nintendo just as much here. I just can't imagine how the first draft looked when it came to their desks. I have to imagine they had some input. That alone scares me. Sorry friend, I would have responded sooner, but I was away for a little bit, and I wanted to give my answer some considerable thought. "The industry no longer looks at Nintendo for innovation or leadership, the industry views Nintendo as the weird guy that keeps trying to reinvent the car when there the models everyone wants to actually drive are selling just fine." I don't want to linger on this topic too much, but I did want to say that they did innovate the industry with the Wii. Yes, the Wii brought about it's own problems, but at the time both Sony with Move, and MS with Kinnect completely copied Nintendo to try and tap the casual market. Nintendo still has the influence, however it's true that it has become a bit misguided. It's obvious the Wii U suffered from the Wii's mistakes, but it all doesn't hinge just on that. The Wii U mostly suffered from poor marketing and initial negative press. "I have finally come around to thinking they need to step out of the console business, and that they could truly dominate the industry as a third party, the way EA can sway MS and Sony these days." "...I think the industry needs to be moving towards a "unified platform format" where any electronics manufacturer can make a game console, all games play on any console..."
Having said that, I do believe that we are very close to Nintendo unifying their own handheld/home consoles, to which I say, it's about time. It's a lot smarter than when we have periods of boom and bust between the handheld software, and the home console software. This would get us closer to what your suggesting as one sustainable machine to run everything. It's not a bad idea, but it does revolve around everyone being on board, and I just don't believe everyone will agree on how to do it. How do you provide a controller to keep everyone happy? I just can't see MS, Sony and Nintendo all sitting down to decide what the controller would look like, especially since they all have their own plans for said generation. Does a random company just come up with the specs and they all just have to settle for what it is? That alone might make them shy away. Not to mention, how do they decide on who gets to make this set top box? Also, how do you go about Virtual Console like games that require older controllers? All of this would have to be prearranged, and could get hairy quickly. I have a hard time believing that said manufacturing company would care to figure it out, since they would have too many other things to do in the first place. Respectfully, It's a cool idea, but I just don't know how it would work in reality, as there's a lot of questions. I can easily admit that the Wii Remote changed a dynamic for a while, but it wasn't a long-lasting innovation like the basic controller layout from the SNES, the modern D-Pad, or the modern analog stick (not-modern would be the utter fiascos Atari cobbled together for the 5200 which were, I believe, the first true analog sticks in the industry. All others were digital.) My point on that is that the Wii Remote was a short-term fad, not an industry-wide innovation. Sony abandoned the Move fairly quickly, and in my humble prediction, there will be no more Kinect games by or after 2016, at least nothing Kinect-specific. I don't think Sega struggles to make money. There's a lot to scroll through to see if I mentioned it here, but their annual revenue is very close to Nintendo's, indeed, they appear to be about the same. Nintendo has lately suffered net losses instead of income, but Sega has been very profitable in recent years. It's not easy to research this, though, the average puts them close together. Nintendo has always been very, very smart with money--this is a company that didn't see losses with the GameCube. This could really go either way. Either they're no longer very good with money, or they are, but the Wii U is just that damaging to their bottom line. I am also not a fan of how poorly Nintendo supports their own hardware, which I think is very damaging to their public image. Sony supported the hell out of the PS1, PS2, and PS3 to the point that they were still seeing regular releases after the successors launched. This maintained their popularity and longevity and value in the eyes of consumers and aided in strengthening the brand. Nintendo has, for some baffling reason, allowed the N64, GameCube, and Wii to sluggishly die off early, which makes the consoles look bad, and makes the new consoles look like questionable investments--or worse, simply removes the company from the attention of consumers. I looked this up once using MobyGames, but the N64 had something like fewer than two or three dozen games released for it during it's last two years on the market. Compared to the PS1, which had well over a hundred, two years after the PS2 came out. Nintendo simply doesn't give people a reason to pay attention to their consoles in the final years. This may seem like it's coming from nowhere, but I think it may well be evidence that Nintendo lacks the ability or integrity to properly support their own hardware long enough to keep consumers interested in them. If they can't even properly support the hardware, it may be time to stop making it. By comparison, the NES and SNES were both still strongly supported after the successor machines launched, and one of Sony's biggest PS2 games--God of War II, launched one year after the PS3. Personally, I was shocked that, for all the sales and hype and popularity of the Wii, that console still died an early, undignified death practically a year before it's successor, with almost nothing from Nintendo and almost no third party support. If a console can sell like the Wii, but still die like the N64, something is terribly, terribly wrong with the company. Don't worry about not getting back to me in this article, it can require a bit of digging and I didn't actually expect you to continue. The points on the unified console are well noted, but I won't address them here. I'm likely to put together the actual blog on it fairly soon, and I'm certainly not going to be able to answer everything as I am just one nerd on the internet. Game seems ok to me, Sure it doesnt have the highest of graphics, or the most action, but if your into mazes, like i am, your sure to love it.